The Yant Flag selection below is from our old website. 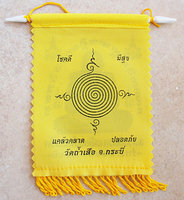 Shortly we will have a new selection of Yant flags at our new shopping site HERE. Check back there to see them! For now, you can look at the images below – these are some Yan Flags we have had in the past. Nong Kwak is the Thai and Chinese (especially) symbol of prosperity and success for individuals and businesses. If your city has a “China Town” and you stop in to some of the stores, you will probably see Nong Kwak figurines, Yants, statues, and other items on a red altar at the store. 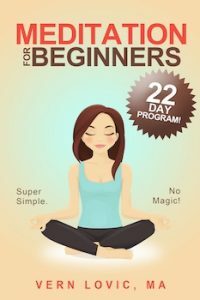 The belief is that she can help you have more customers by calling people into the store. 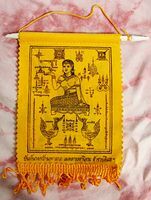 In this yant you can see that her hand is in the Thai position for waving people in… not waving goodbye, calling people in. 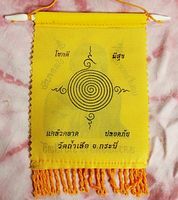 Most Chinese and many Thais will not open a store without having a special shrine for Nong Kwak. 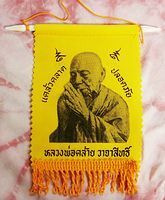 Luang Phor Tuad was the son of King Rama II and probably the most revered, respected, and loved Buddhist monk in Thailand. 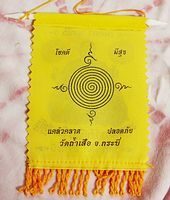 There are more Luang Phor Tuad amulets and other sacred items with his image – than any other monk in Thailand. He is said to have had unique powers that he treated as if they were nothing important. 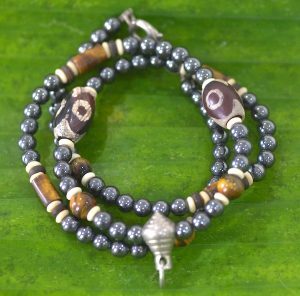 His amulets are always in demand and all amulets with his likeness are protection from harm amulets (good health, protection from accident and injury). Trying to find these again. High quality print, very detailed. These are made of a fabric, not paper. Almost like a light linen fabric. 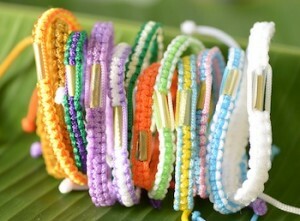 We have only a few of these – we found them in Sisaket, and we’re not sure we can find anymore. 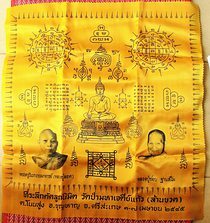 We’ve never seen them at any other temple – so maybe these 4 are the only Luang Phor Tuad Poster Wall Hangings we’ll have. Limited Edition, we have just 4 of these. These are very high quality and we cannot believe we haven’t sold all of them yet. The price is very good and I think the photo just doesn’t show the quality very much. If you order this yant you will not be disappointed – I am sure of that. 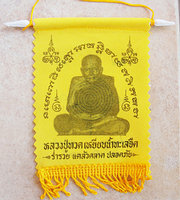 See a short video about some blessed Buddhist Yant cloths (Yant flags).